Other benefits include: smooth exterior for easy washdown, resistant to Sodium Hypochlorite (Bleach), will not promote bacteria growth, and offers working temperatures of -30°C to 80°C Dry / 60°C Wet / 70°C Oil. Commonly used in air conditioner, pool and sauna installations. 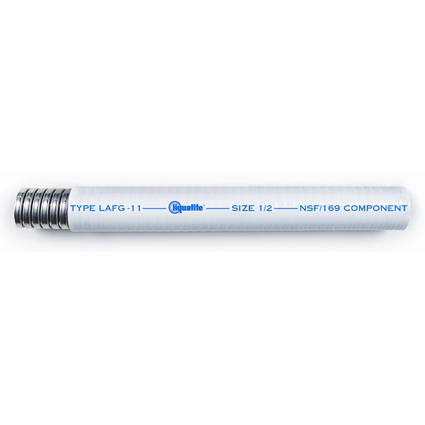 They consist of UL Listed flexible nonmetallic conduit, nonmetallic connectors, 8 and 10 AWG Conductors, conduit sizes ½” and ¾”, and 4 and 6 foot lengths. These Nonmetallic A/C Whips are corrosion, oil and sunlight resistant. Type ZHLA, is now both UL listed and CSA certified. Type ZHLA is ideal for field installations in confined, public areas because its thermoplastic polyurethane jacket has excellent flame resistance, low smoke, and toxicity generation characteristics. It is also resistant to ozone, hydrocarbons, moderate chemicals, oils and fuels.